"Menlove Ave." is a collection of alternate versions and outtakes from the recording sessions which yielded the albums "Walls & Bridges" and "Rock 'n' Roll." 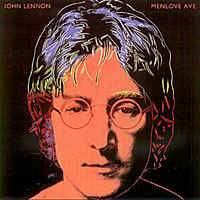 It is named after the street name of John Lennon's childhood home. It was released Oct. 27, 1986 (US) and Nov. 3, 1986 (UK). WOND'RIN' WILL IT EVER END. WHERE IT'S GOING, NOBODY KNOWS. SOMEONE KEEPS ON MOVING THE DOOR. ROUND AND ROUND WE GO-OH. I JUST COULDN'T CHANGE IT IF I WOULD CHOOSE TO. I CAN SEE YOUR SHININ' SHOES. WE ALL KNOW YOU'VE BEEN SCREWED. MY MOTHER WAS A SON. OR HOW MUCH SPACE I NEED. YOU'LL KNOW WHERE SHE'S BEEN. ROCK, ROCK, ROCK AND ROLL. This tune is one of my all-time favourite songs. Send my love to Rosie where she may be. BUT AFTER ALL, I LOVE YOU, I DO. ANGEL BABY, MY ANGEL BABY. NO ONE CAN LOVE YOU LIKE I DO. BECAUSE I LOVE YOU, I LOVE YOU, I DO. I'M SURE YOU'LL COME BACK HOME. Okay! Okay! This is it, children! HEY, HEY, HEY, HEY - HEY! AIN'T GOT NO SWEET, NO, NO, NO. MY BABY EVEN LEFT ME, NEVER SAID A WORD. MY BABY EVEN LEFT ME, NEVER SAID GOODBYE. WHEN I, I WALK ALONG SIDE OF HER. IS TO LOVE, LOVE, LOVE HER. YEAH, I DO, OH, I DO. WHY, WHY CAN'T SHE SEE? OH, HOW, HOW BLIND CAN SHE BE? THAT SHE WAS MEANT JUST FOR ME, OH YEAH. MAKES MY LIFE WORTH WHILE. YOU KNOW, IS TO LOVE, LOVE, LOVE, LOVE HER. AND YOUR NEW YORK TALK. BUT YOU'RE GONNA WISH YOU WASN'T BORN AT ALL. HOW DOES IT FEEL TO BE OFF THE WALL? BUT YOU CAN'T PULL STRINGS IF YOUR HAND ARE TIED. YOU LEAVE YOUR SMELL LIKE AN ALLEY CAT. YOU'RE GONNA WISH YOU WASN'T BORN AT ALL. AND THE STRAWS SLIP AWAY. CAN GET YOU OUT OF THIS, OH NO! I JUST WANNA STAY ALIVE. I GUESS YOU KNEW IT RIGHT FROM THE START. THE GREEN EYED GODDAMN STRAIGHT FROM THE HEART. NO MORE WEATHER ON THE OLD DIRT ROAD. IT'S BETTER THAN A MUDSLIDE, MAMA, WHEN THE MORNING COME. OH, OH, OH, OH, OLD DIRT ROAD. TARRED AND FEATHERED ON THE OLD DIRT ROAD. TRYING SHOVEL SMOKE WITH A PITCHFORK IN THE WIND-IND. I SAW A HUMAN BEING LAZYBONIN' OUT IN THE HAY. I SAID, "HEY, MISTER HUMAN, CAN YOU RAINMAKER TOO?" OH, OH, OH, OH, OH, OLD DIRT ROAD. TRYING SHOVEL SMOKE WITH A PITCHFORK IN THE WIND, YEAH. EV'RYBODY LOVES YOU WHEN YOU'RE SIX FOOT IN THE GROUND. STILL WE'RE DEEP IN EACH OTHER'S HEARTS. AH, AH, AH, AH, AH, AH, AH, AH. NOW THAT WE SPREAD OUR WINGS. THE HOLLOW RING IS ONLY LAST YEARS ECHO, OH. BE WARM AND KIND HEARTED. ED, ED, ED, ED, ED, ED, ED, ED. NOW AND FOREVER, OUR LOVE WILL REMAIN THE SAME.